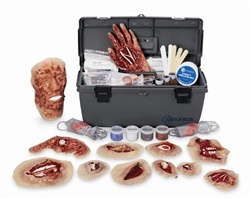 The Xtreme Trauma Moulage Kit represents wounds that result from explosions and chemical disasters. These simulated trauma wounds will assist in training exercises for military and government responders, and anyone providing treatment to victims injured in disasters and war. To augment training, Simulaids brings to the field a new package, created in a new medium. Detailed sculpting and painting create realism for the training of medics responding to these events.